Recorded on the tour to support his emotionally crushing response to personal tragedy, the 2016 album "Skeleton Tree", which I was fortunate enough to witness in Glasgow in December 2017. A four track vinyl and digital EP that gives a flavour of the gothic revivalist preacher ministering to both his congregation and himself. It kicks off with "Jubilee Street" from 2013's "Push The Sky Away". With a typical constantly circling chord progression, it serves to showcase the live Bad Seeds experience well. The atmospheric playing, with a slow build that constantly teases you into thinking it is going to lift off until a dramatic explosion 5 minutes in takes it to the next level. This along with the elegiac and moving "Distant Sky" really capture what it felt like to see them live on this tour. The duet vocals between Cave and Else Torp are something special. Equal parts despair and hints of future hope, with haunting violin from Warren Ellis. 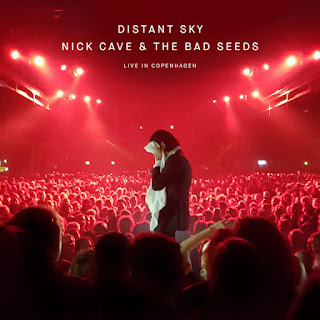 It is fitting that it is the title track of the EP, as it really captures the sound and atmosphere of the "Skeleton Tree" album, along with the emotional punch that the live experience delivers. "From Her To Eternity" doesn't work as well for me here. I've never been a huge fan of this particular song, and it suffers from coming directly after two stunners. To keep the feel and mood of the EP consistent, I'd have preferred either "Push The Sky Away" or "Skeleton Tree". Both were amazingly uplifting live experiences. "The Mercy Seat" is both one of Cave's most well known and most played songs. Whilst the version here is perfectly fine, the title track towers over this EP, casting a shadow that does the final two tracks no favours. Perhaps a running order of "From Her", "The Mercy Seat", "Jubilee Street" and "Distant Sky" would have worked better. In summary, don't let my concerns on running order and track selection deter you. If you like Nick Cave this is an essential purchase purely for "Distant Sky" itself. For the more the casual listener, check out the title track and if you enjoy what you hear it may serve as an entry point to the album which spawned it.